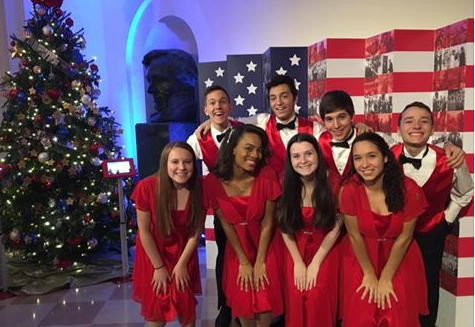 Members of Belles of East and Voce got an opportunity to perform at a private holiday reception at the White House in December. Cherry Hill High School East musical groups Belles of East and Voce had played in a number of prominent settings before. From performing at Carnegie Hall to Longwood Gardens, the groups had done a number of performances in front of hundreds of spectators. However, nothing compared to their performance on Dec. 15. Belles of East and eight members of Voce traveled to Washington, D.C., to perform at a private holiday reception at the White House. The two groups teamed up to perform an hour of holiday selections and got a chance to have a private meeting with President Barack Obama. In Belles of East, the members perform songs on a set of bells and sing at the same time. Senior Elizabeth Hallinan is one of the members of Belles and got the idea to have the group apply to perform at the White House after speaking with her mom in 2015. Hallinan originally applied to have Belles perform at the White House in 2015, but the group was not chosen. In early November, Hallinan finally received an email from the White House saying Belles had been selected to perform at a private holiday White House reception on Dec. 15. Their selection was confirmed in late November. Belles only had a few weeks to prepare for the show. The group performed a number of other holiday shows around the region prior to the White House, so they had a number of winter and holiday songs already memorized. Since the group could bring up to 24 performers and there were only 16 members of Belles, eight seniors from Voce, Cherry Hill East’s mixed chamber ensemble, were invited to join Belles. “We learned mores pieces we could do with Voce, just straight carols,” Cherry Hill East music teacher Laurie Lausi said. The students practiced the carols as often as they could in the days leading up to the reception. The students prepared for the reception in private. The group was not allowed to speak publicly about the reception in advance. When the students arrived, they were blown away. The group got to see much of the White House decorated for the holidays. The reception was for the White House staff and their families. With it being the final chance for many people to see Obama before he leaves the White House, the reception had a special feel to it. “The party was like a thank you party for (the staff),” Hallinan said. The highlight of the day was a private meeting with the president. The students went into a separate room where they got to meet Obama. The group performed “Carol of the Bells” for the president during the private meeting. “When we sang to him, he started dancing,” Belles member Jessica Payne said with a laugh. Trauger thought it was amazing to be able to perform for Obama considering all of the students have grown up with him as president since elementary school. Belles of East and Voce will have many more performances to come. However, everyone who went on the White House trip agreed nothing will ever beat singing for the president.